Do you usually wake up with a sore jaw or headache? When you look at your teeth in the mirror, does it seem like they’ve been worn down flat? If so, then you may be one of the millions of Americans who suffers from bruxism. This is an extremely common condition that can severely damage the teeth over time, but fortunately, Dr. Eick can help patients better understand this issue and find a solution to overcome it, which is probably much simpler than you might think! 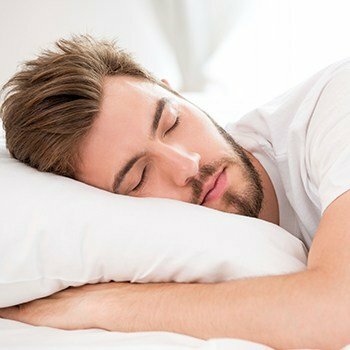 Why Choose Dr. William Eick for Nightguards for Bruxism? Common symptoms of bruxism include a sore jaw, headaches, or earaches. Causes vary but may include stress, anxiety, tension, misaligned teeth, posture, diet, sleeping habits, and other factors. Bruxism is most prevalent in women and generally found in about one-third of the population. 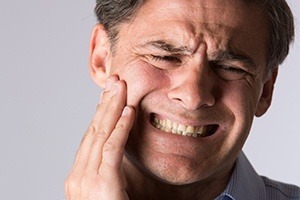 Constant clenching and grinding of the teeth cannot only cause the symptoms, but it may also contribute to TMJ (temporomandibular joint) dysfunction, which has a long list of side effects associated with pain in the head and neck. Teeth rubbing together consistently will result in surface wear over time, which will cause dental problems. Insomnia, eating disorders, and depression can result from bruxism if left untreated. How can you stop an unconscious habit? A thorough evaluation will allow us to check your teeth, tissues, and muscles. 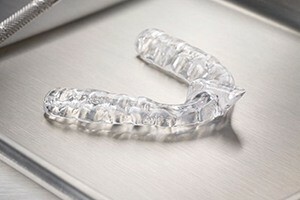 If we determine that you suffer from bruxism, we'll create an oral appliance, also called a nightguard or splint, to prevent grinding and clenching. Many types of nightguards exist, and patients react differently to the various styles. If one appliance does not work, another may. In many cases, simply wearing a nightguard will eliminate the problem. However, if the condition persists, we can prescribe alternative therapies to correct the issue.